With winter rains, Bay Area pill bugs are out in force. Fortunately, they’re one of our most beloved “bugs.” Pill bugs. Doodle bugs. Potato bugs. Wood Shrimp. Whatever you call them, there’s something less creepy about these critters than other insects. Maybe it’s because they’re not insects at all. Pill bugs are more closely related to shrimp and lobsters than crickets or butterflies. Their ancestors lived in the sea, but ancient pill bugs crawled out millions of years ago to carve a life for themselves on dry land. You can see the evidence if you take a close look at them, so that’s exactly what we did for this episode of Deep Look, an ultra-high definition wildlife video series produced by KQED and PBS Digital Studios. “Kids love them,” said Jonathan Wright, a professor of biology at Pomona College who studies the charismatic creepy-crawlies. After all, who hasn’t delighted as a youth in annoying a pill bug until it defensively curls up into a little armored ball? 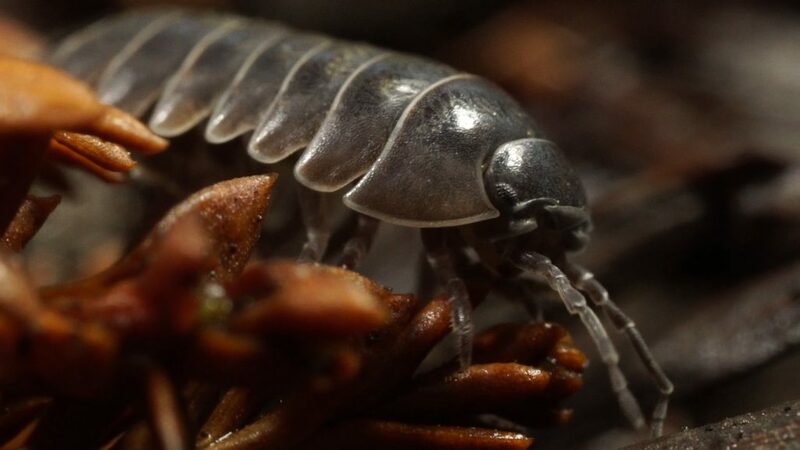 They may not be ready to replace shrimp as an appetizer, but according to Wright, the evidence of the pill bug’s evolutionary lineage lies underneath its shell. “Like their ocean ancestors, pill bugs have gills,” said Wright. Gills work great in the water. They’re basically exposed mucous membranes that absorb oxygen out of the water and into the blood that feeds the rest of the body. But on land, gills are a liability. If the pill bug dries out, its gills won’t function properly and the pill bug can suffocate. That’s why you usually only find them in damp areas, like under a dead log. If they start to overheat and dry out, pill bugs will even roll into a ball to protect the remaining moisture on their gills. 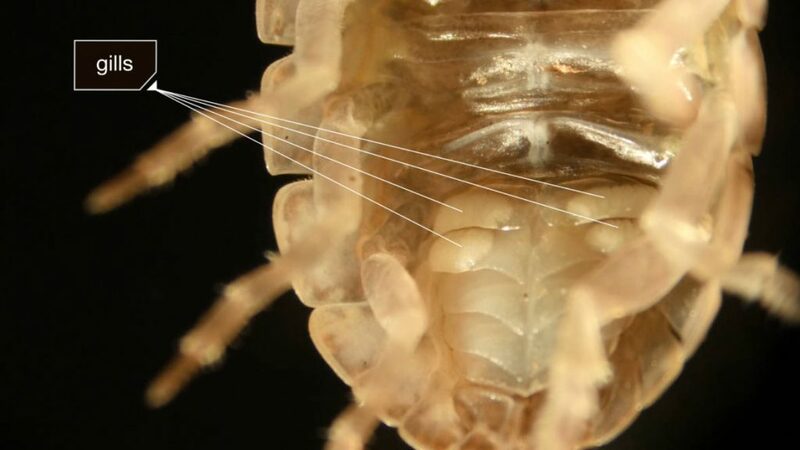 Unlike pill bugs, terrestrial insects breathe through a system of tubes called tracheae that connect to the air through tiny muscular valves on their bodies called spiracles. The spiracles open to allow air into the tracheae, which deliver oxygen directly to the insect’s tissues. 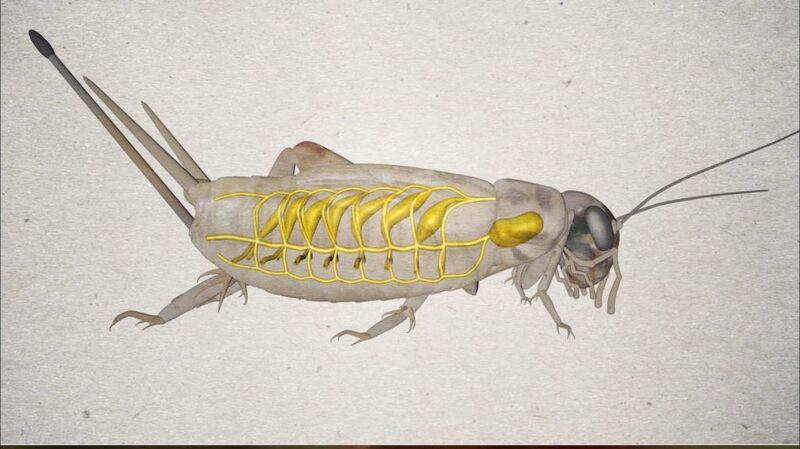 For smaller animals like insects, the tracheae system is extremely efficient at delivering oxygen. It allows animals like bumblebees to sustain the enormous amount of effort required to fly from flower to flower. Insects can also adjust the amount of air they let into their respiratory system. The insect’s tracheae system is much more efficient at reducing water loss when you compare it to the pill bug’s gills. But over evolutionary time, the pill bug’s gills have adapted to life on dry land. Folds in the surface of their first two pairs of gills eventually turned into hollow branched structures, almost like tiny lungs. In 2015, a study by Yale and several other universities found that terrestrial crustaceans like pill bugs may play a very real role in controlling the global climate. Pill bugs consume fungus that is responsible for breaking down organic matter in the soil, a process that releases carbon dioxide into the atmosphere. As the atmosphere warms, the fungus activity increases, resulting in more carbon released and even higher atmospheric temperatures. It’s a dangerous vortex. But when pill bugs and their kin are present, they’re able to mitigate the effects of increased temperature by consuming more of the fungus. They’re small, but pill bugs may be protecting us by slowing climate change.